Established in April 2012, the NIHR School for Public Health Research (SPHR) is a partnership between eight leading academic centres with excellence in applied public health research in England. The NIHR School for Public Health Research is a partnership between the Universities of Sheffield; Bristol; Cambridge; Imperial College; and University College London; The London School for Hygiene and Tropical Medicine (LSHTM); LiLaC – a collaboration between the Universities of Liverpool and Lancaster; and Fuse – The Centre for Translational Research in Public Health a collaboration between Newcastle, Durham, Northumbria, Sunderland and Teesside Universities. SPHR is one of three national research schools alongside the NIHR School for Primary Care Research and the NIHR School for Social Care Research funded by the National Institute for Health Research (NIHR). Each national school is a unique collaboration between leading academic centres in England, carrying out outstanding research in their respective fields. This research can be applied across the country to meet the needs of policymakers, practitioners and the public. This list is not exhaustive and we encourage applications proposing innovative and novel ideas. * Effectiveness in this context encompasses efficacy, effectiveness, and implementation effectiveness. Evaluations should focus on a health-related outcome, and be accompanied by process evaluation where feasible. Health economic evaluation of all interventions is encouraged. We encourage evaluations of interventions across multiple sites where feasible and appropriate to improve generalisability. We also encourage use of rigorous research designs employing random allocation where feasible and appropriate controls, or observational designs that can evaluate interventions as natural experiments. SPHR values collaboration and partnership working. Therefore, public health professionals should play an active role in the research process. SPHR members will design and conduct the evaluation and fund most of the research costs. However, the successful partner organisation(s) will normally be expected to make a significant contribution to the research. This may include financial resources and/or staff time, for example, seconding a member of staff to be actively involved in the research process, joint data analysis and interpretation, and ensuring the best use of local knowledge and data. PHPES does not provide funds for external organisations or groups to conduct evaluations independently. 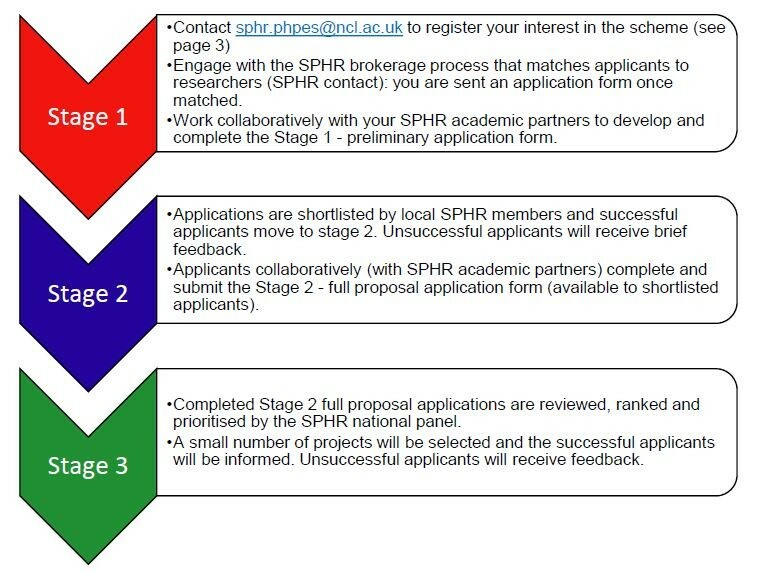 The brokerage process facilitates the matching of applicants to SPHR members/researchers, via sphr.phpes@ncl.ac.uk. If you are already in contact with a member of SPHR, you will be sent an application form and you can go ahead and work together towards submission. If you have not identified a member of SPHR to work with, your note of interest will be sent to a member of SPHR based on locality and expertise (provided that it meets the eligibility criteria). Once you are matched to a researcher, a Stage 1 application form will be sent to you. All notes of interest will go through a local (i.e. one of the SPHR members as detailed on page 1) triaging process that will consider local expertise, capacity and suitability. If this process identifies projects that are suitable for support but there is a lack of capacity/specific expertise in the local area, they will be sent back to the brokerage stage to identify if there is capacity/expertise elsewhere in SPHR. The brokerage process also enables us to signpost to alternative services (e.g. NIHR phinder which aims to connect practice evaluation proposals to researchers) if we are unable to support a registration of interest to progress to Stage 1. Please note that we expect to receive more applications than we can fund. Support from a member of SPHR: all Stage 1 application forms must be signed by your SPHR contact. Capacity and expertise: this will be assessed at a local and national level, both through the brokerage process and if you are matched with an SPHR researcher. Fit with SPHR priorities: We are interested in evaluating local interventions that have the potential to impact on population health and reduce inequalities. Your intervention should be focused on a high priority public health issue or problem and aiming to change the environment in which people live and work and/or change lifestyles and/or behaviours. We will also consider projects or initiatives aiming to improve public health services. Why this and why now? : You should provide some background to the development of your intervention, the evidence it is based on and why now is the right time to develop, roll out or evaluate the intervention. The intervention should not have been the subject of a previous high quality evaluation. Transferable to other areas: You will need to demonstrate that your intervention has the potential to be of benefit in other parts of the country. This may be because of the public health issue being addressed, the target population and/or the nature of the project or initiative. Active role of practitioners in the research process: Practitioners should have an active role in the research process to ensure successful collaboration. This could include practitioners acting as peer researchers, joint data analysis and interpretation, and making best use of local data and knowledge. Able to be evaluated within PHPES funding and time limits: PHPES will normally support evaluations that can be completed by December 2021 and cost between £50k and £250k. However, we realise that timescales may need to be flexible to adjust to changes in the intervention and organisations’ context. Local contribution: The organisation(s) funding or implementing the intervention will be expected to contribute in cash or kind (for example, by seconding a staff member to the research team) to the research. Secure funding: Your intervention must have secure funding (for delivery/implementation) for the duration of the evaluation (normally a maximum of 24 months). If your evaluation project is shortlisted, you will be invited to apply to Stage 2. You will then work collaboratively with your SPHR contact to complete the full proposal application form (released to shortlisted applicants). Stage 2 applications will undergo peer (practice and academic) followed by consideration and shortlisting by a national panel. There may also be potential for projects that are funded within the PHPES to be signposted to a regional NIHR CRN to be considered for adoption onto the NIHR CRN portfolio. Following the national panel, unsuccessful applicants will receive constructive feedback on their proposals within four weeks of the decision, and, where appropriate, information on other sources of advice or funding will be provided. The SPHR Knowledge Exchange Broker, Dr Kara Danks, and designated contact persons at each member organisation will be available to support with this. Please register your interest and following the brokerage process you will be sent an application form. Please send completed Stage 1 preliminary application forms to sphr.phpes@ncl.ac.uk before the deadline on Monday 3rd June 2019. Please note, the application must be endorsed and signed by a member of SPHR and requires collaboration to complete, therefore it is advised that you register your interest by end of April/early May 2019. The Stage 2 application form will be released to shortlisted applicants. Please note that we expect to receive more applications than we can fund. If you have any queries, please do not hesitate to contact sphr.phpes@ncl.ac.uk.